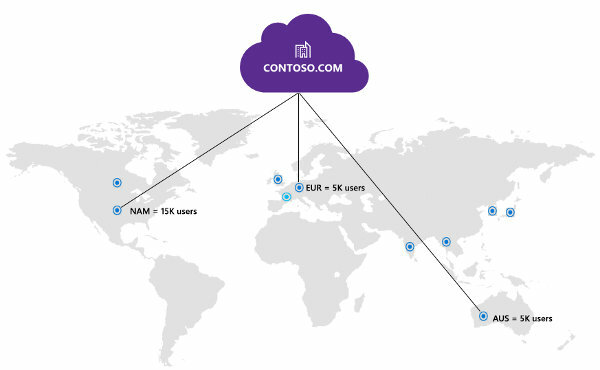 The Multi-Geo feature in Office 365 will fill the biggest gap that the Microsoft cloud suite had for the management of data of an organization across multiple countries. Let’s have a deeper look at this great feature. An Office 365 tenant had to have its data stored in a single data center: it could be European, American, Japanese, etc. So a company with offices in several continents was forced to use multiple tenants if they wanted to save their data in different regions, with a single tenant they would probably face problems of speed and reliability. It was also an inconvenient for storing sensitive information (existing local legislation, data protection issues …). Multi-Geo is here to solve all these problems. The new feature allows to choose a location for each user, for storing their Exchange or OneDrive data. If an English company has an Asian branch in South Korea, it will be possible to distribute the accounts of each user, depending on whether the data is stored in the United Kingdom or Korean data centers. With this new configuration, each site has more autonomy and control of their own data, providing better performance and speed, and better management of sensitive data. The administrator of the tenant has to perform a few steps to make multi-geo available in Office 365, since the transfer of data between locations is not done automatically. First of all you have to activate the regions where you want the tenant data to reside. Subsequently each end user account is assigned a preferred region (attribute already available in Azure AD): if it differs from the initial one that was specified when creating the tenant, the data will be automatically moved to the specified server. Of course, all of this is transparent for the end user, who will be able to continue using the services in an without interruption. As of today, Multi-Geo is not available on all tenants. The administrative portals for OneDrive and SharePoint Online already have a menu to select between the activated regions in the tenant, while some Exchange Online cmdlets still need to be updated. In general, Multi-Geo is expected to be fully available for Exchange and OneDrive during the first half of 2018, while in SharePoint it should be available somewhere in 2018. Additional information can be found on this Microsoft website.